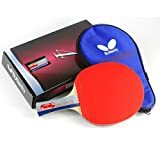 The Butterfly 303 Table Tennis Racket is a unique ping pong paddle that is engineered to help you win every ping pong game. 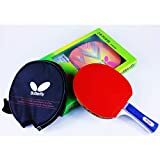 The ping pong racket is assembled with pips in Yuki 2.1mm table tennis rubber on one side and pips out Magnitude 1.9mm table tennis rubber on the other side. The Yuki rubber is extremely tacky, offering tremendous spin on your ping pong shots. Meanwhile, Magnitude is a pips-out rubber with a longer pip than most traditional pips-out surfaces enables you to defend spinny ping pong shots. The longer pips on this ping pong paddle will also add numerous varieties of spin to your ping pong arsenal. The grip is very comfortable allowing better control when smashing ping pong shots at your opponent. This ping pong paddle also comes with its own ping pong paddle cover. The ping pong paddle case is included to protect the table tennis rubber from harmful elements. This prolongs the life of your ping pong paddle. 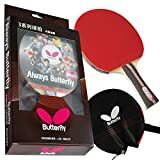 Butterfly table tennis paddles come with a 30 day manufacturer warranty. 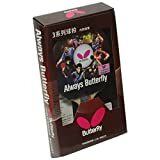 Butterfly table tennis rackets are the preferred rackets of professional table tennis players around the world built with exceptional quality for competitive ping pong games. Step up your ping pong game with the 303 Ping Pong Paddle by Butterfly Table Tennis!